I recently played the Professor Layton games while also making my way through Halo. At first, it appeared to me that the games were structured similarly: Whether it is vanquishing the Covenant or locating the mysterious golden apple, both games present players with objectives that must be accomplished in order for them to progress to the next scripted event. However, I soon began to wonder if Master Chief was upstaging Layton in his attempt to give my brain a workout. At the same time, I found myself becoming disengaged with Layton's gameplay and simply looking forward to the next story bit or cutscene . How was it that a game about space marines was more mentally engaging than one about a puzzle-loving professor? The answer exemplifies the pedagogical strengths of video games and demonstrates that linearity in games is a layered concept. At the most basic level, Halo is a game that leads the player through a predetermined story with a variety of mandatory plot points. The genius of the game lies in the way players move between those pre-determined plot points. The level design and enemy AI make Halo's gameplay highly dynamic. 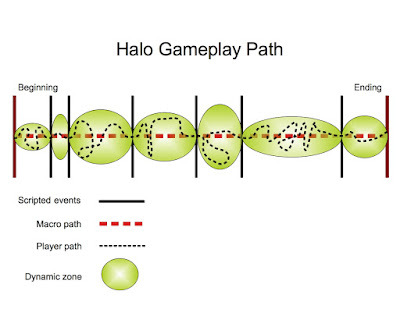 Halo is structured around sequences comprised of what Steve Gaynor has called "the basics of effective first person shooter encounter design." Instead of maze-like hallways, most of Halo's fighting takes place in environments with a variety of cover clustered in a circular pattern, laid out in such a way that the player can observe the environment and get a good sense for what tactics will help them succeed. Additionally, Halo's enemies' AI exhibits a wide range of behavior. Enemies rarely stand still and allow you to exchange fire; they will duck behind cover, charge you with clusters, or even retreat in fear. The varied combat environments and unpredictable enemies give rise to dynamic, chaotic, and rarely replicable gameplay. While the overall game's structure is linear on the macro level, there are dynamic zones in between scripted events that allow the player to exercise their creativity and experience unique events. When Jorge and I were playing the game on co-op, one errant-grenade throw could potentially scrap a carefully laid plan and force us to come up with a new solution on the fly. If we got stuck, a change of tactics would cause us to experience a the level differently than the first time we attempted it. On the macro level, Layton's structure is reminiscent of Halo. While there are many optional puzzles, progression is tied to certain mandatory challenges that divide the game into sections. 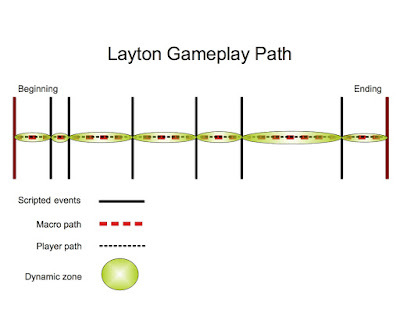 Layton diverges from Halo by retaining this linearity during the intervening gameplay spaces. Regardless of how creative or clever the player is, there is only one path to success in Layton: guessing one predetermined answer. If someone wanted to tweak their Halo experience by only using the pistol or by relying largely on melee fighting, they could so so while simultaneously remaining tethered to the game's overarching path. With Layton, there is little room for experimentation; to quote the Professor "Every puzzle has an answer." And by "an" he means "exactly one:" regardless of whether the player can think of a different way to stack chairs, retrieve a ball from a hole, or exploit vague language, the only route through the game is unvarying adherence to a single path. The game becomes doubly linear, as both the game's overall structure and the player's path become one and the same. While this may be a valid game structure, it can often undercut the medium's strengths. When forced to follow a rigid path, the player loses much of their agency and finds themselves at the mercy of the designer's thought process. This might not be a problem depending on the game's readability and feedback system, but if things do get vague, the player may find themselves compelled to brute-force their way through obscure, single-solution problems. Additionally, in order to keep things interesting, the game must then compensate for this lack of interaction by relying on the strength of its story, characters, and art direction. The Monkey Island and Zelda series show that this is possible, albeit extremely difficult. While all games require a certain suspension of disbelief, even the best puzzle and adventure games sometimes parlay this into a demand for passive acceptance of arbitrary, limiting systems. In this sense, games featuring a dual-linear structure share much in common with books and films: the story, sequence of events, and presentation are predetermined and largely static. Change can only be effected by interpretation and analysis after fact. Instead of getting bogged down in the minutia of a puzzle, Halo presents the player with a general problem along with the tools to solve it. Most of the game boils down to "get to that door," but because the environments, enemies, and player behavior create dynamic spaces, I found myself looking at each level like a puzzle comprised of many interconnected parts. While they are often clever, the problems and solutions in Layton can also be pedantic. The approach to puzzles is overwhelmingly traditional, and most of the game would remain relatively intact if converted into book form. Video games allow us to create laboratories dedicated to actively exploring dynamic situations in which the environment and objects become a puzzle. Layton's brain teasers provide a mental workout, but they seem ill-suited to the medium's unique pedagogical potential. Both Halo and Layton follow largely in the tradition of author-controlled narratives. However, Halo offers the opportunity to stray off that well-warn path, thereby opening up the possibilities for unique challenges and unexpected lessons. 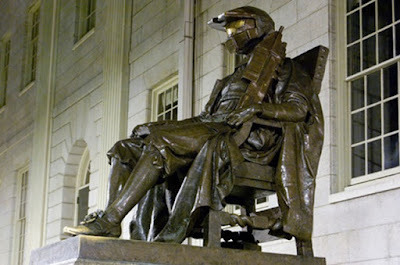 For example: I learned that a Spartan can be just as thought-provoking as a Professor. Those diagrams are fantastic ways to depict a game's—or at least a game's player's play session's—movement and exploration through the player's conceptual space (would one call that "ludic space"—the kind that Corvus Elrod talked about once?). Did you invent them yourself? Were you inspired by someone? Or was it someone else's idea? If it's from your own mind, then I hereby propose to call them "Juster Diagrams" and use them as standard ways to depict a player's playing of a game! Much better than clumsy, pragmatically ambiguous words like "nonlinear" or "open world". One quibble on Professor Layton; the player can choose to skip many puzzles. She can't solve any in a different way, but she can solve as many or as few as she likes, within certain limits. I, like any true follower of the Way of Layton, strive to solve every puzzle as soon as they are available. But one who was less of a gentleman could take a route that was, well, not different, but abbreviated. They're from my own mind, but I'll readily admit that my mind is continually shaped by a variety of talented writers and thinkers. As you suggested, it was largely my attempt at describing games without using the standard terminology. Hey thanks for stopping by. I was wondering if anyone was going to point out the many optional puzzles, and here you are! You're right in that optional puzzles might make for different players experiencing the game slightly differently. However, I would argue that the overall "shape" of the game stays the same. If graphed on to my diagrams, the optional puzzles might look like smaller hash marks between the major plot points. Additionally, the way in which the player solves the puzzles, optional or not, is always the same: a single, predetermined, inflexible answer. As you point out though, the Layton's rhetoric suggests that leaving puzzles unsolved is unbecoming of a gentleman and, by extension, the player. I wonder how people would feel if the ending changed based on how many puzzles you solved? Two thoughts that came to mind when reading this (great post, btw). 1) It's very difficult to make games of the former type that aren't primarily about violence. Portal would probably come closest. And while there isn't necessarily a problem, it is a bit limiting. 2) The former are *much* more complicated and expensive to make. The Layton team was probably 10-20% the size of the Halo with an even smaller budget. Do we need less linearity in non-action games? Perhaps. I'd like to figure out how to do that better. But it's a hard problem to solve and for various reasons, our best and brightest aren't focused on it. Who knows though, maybe they'll come around yet. Oh man, I love the diagrams. Not so pretty, but they make the concept click beautifully. What this really boils down to, is there are two axes of linearity in game design: WHAT you do (the axis where Layton and Halo are both linear); and HOW you do it (the axis where Halo is dynamic and Layton is static). Absolutely fantastic! I think part of what creates the HOW-depth is the contest. You have two (or more) actors working against one another in a somewhat fluid way. This means you can try to do the same thing twice, but because of the unpredictability of your input or theirs, you can get a different result. This lets you try the same basic strategy multiple times without getting identical responses, and makes the game feel dynamic. I think that's part of why HOW-dynamic games tend to be modeled on violence, the most obvious case of two forces working against each other is violent conflict. That's not to say it's the only model for conflict, others are prevalent in board games for instance, but their obviousness and the tradition of violent multiplayer games conspire to create strong incentive. I think in general linearity is greatly underrated in any type of game. FFXII was basically ruinedat least for me) because they gave up on the formula of linearity and tight storyline, that made FFX so great. The interesting thing is, that games like Far Cry 2 fail(at least partly) because of the difficulties non-linear game design seems to make. Just look how people complained about a pretty much non existent coherent storyline, tiresome journeys between or within missions and respawning enemies in areas they have passed several times already. Halo on the other hand fails(to a lesser extend but still) because of the difficulties linear game design seems to make. In this case especially the identical looking corridors in the first game come to my mind. Nontheless in my opinion Halo might be closest to what you may call "The best of both worlds"
The Darkness would be another great example, however here it's more about non-linearity between missions not so much within the actual core-gameplay-killing enemies-moments. Great article. The diagrams remind me of something similar I've read before, I think it may even have specifically related to games. It's a great way to visually explain what is happening. I'll second the notion that violence isn't the only way of interacting with other game actors. It's perhaps the easiest interaction, but certainly not the only one. Great points both on violence and complication. I wish I had a good idea for how to go about changing this, but the structure of "kill to win" is a really hard one to deconstruct. For a while, I thought that Scribblenauts might be able to pull this off, but its execution didn't pan out. Excellent point how adversarial relationships breed HOW-dynamics. This actually makes me excited to play New Super Mario Bros. Wii. Even though the levels look linear, I'll bet the player-interaction will make each person's playthrough quite unique. Although the idea of completely emergent stories is currently hot, I agree that humans are predisposed to enjoy being told stories. There's a certain type of learning that comes from not being in total control, and I think your FFX and Far Cry 2 examples illustrate that. Thanks for the compliments Tesh. I've been trying to think of some good examples of non-violent interaction that still provides dynamic situations. Although they are basically linear, perhaps complicated dialogue trees have the potential to give players vastly different ways of navigating identical situations.